This wheat germ based food is recommended for Spring and Fall temperatures. 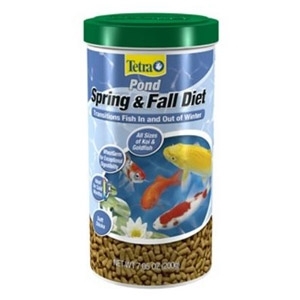 Wheat germ‘s exceptional digestibility at low temperatures is very important since fish metabolism and the pond’s ammonia-reducing biological activity are greatly diminished in colder months. Feed in spring and fall, when water temperatures are below 50°F and above 39°F. Stop feeding when temperatures drop below 39ºF. 7.05 oz.